Hello Everyone I hope you are enjoying Before Shared Whatsapp Tricks & Tips, but today we are aware new whatsapp feature named delete for everyone & Delete for me. We Already Discussed about this in Whatsapp Upcoming Features article , Now this Feature is Successfully Working in Latest Whatsapp Version. In Before Versions We Can’t delete Message in Recipients chat once it Send which Shows one tick After hit Send or Enter Button. But Now Delete For Everyone or Delete for Me Feature will Help you to Remove Message After Hit Send or Enter button if Receiver is Online. This Features will Work on Both Personal & group Chats. 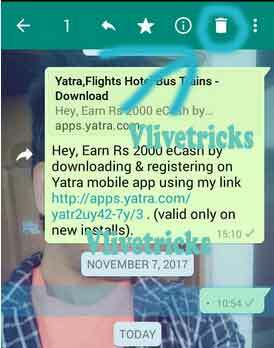 This time they introduced in All Android , Iphone , Windows , Whatsapp Web Platforms. The feature is Introduced Because Many times We Send Wrong Messages in Wrong Chats or groups Due to Rush. In Previous version if we Deletes the Sent Messages then It Doesn’t Effect on recipients Chats but now its Possible to Delete that 2 Tick or Blue tick sent Messages Where your recipients Will See the Message Was Deleted. The Feature is Working Like Charm in Media Also. 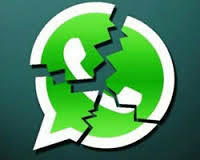 1 How to Delete 2 Tick Sent Messages in Official Whatsapp ? 1.3.1 Is it Possible to delete after showing 2 ticks or Blue Tick Before 7 Minutes ? 1.3.2 If i Am Using latest but Recipients Not Using latest Version ? 1.3.3 Can i Delete More than 1 Message at Same time ? 1.3.4 What will Show in Recipients Chats After Click on New Delete for Everyone Option ? 1.3.5 What will Show in Your Chat After Click on New Delete for Everyone Option ? 1.3.6 Is this will Work on whatsapp Web ? How to Delete 2 Tick Sent Messages in Official Whatsapp ? This Feature Will works on all Android OS but Only you have to Update your app to latest 2.17.393 or Newer Versions. Select Option no. 3, Done ! No you will see You deleted this message & Receiver will see The message was Deleted. You have to Complete this Before 7 Minutes , other wise you can do only Delete for Me. In that Feature, You can Delete Your Sent Messages in your Chat Data only. After this your Message will Show to the Receiver Chat because it will not Effect on Recipients Chats. This Feature will always available & After using this Your Message Will not be Save in your database Also. If You will select cancel then Your Message will not Be Deleted. Is it Possible to delete after showing 2 ticks or Blue Tick Before 7 Minutes ? If i Am Using latest but Recipients Not Using latest Version ? If you are using latest Whatsapp Version then You will see this Option But if your Recipients not using then The Message will not Deleted in your Recipients Chats. Can i Delete More than 1 Message at Same time ? Yes, after Select 1 Message then you will get Option to Select More. What will Show in Recipients Chats After Click on New Delete for Everyone Option ? What will Show in Your Chat After Click on New Delete for Everyone Option ? Is this will Work on whatsapp Web ? Yes , It is Working on whatsapp web after Updating app to Latest. I personally Checked it. Yes, It will work on all type of Messages.